For Great Facilities, Comfort & Affordability you can't go past No.8 Willesden! Whether it is your first time in London or you are a seasoned traveller, No.8 has everything you need (and a few extras) and will ensure that your stay in London is definitely Enjoyable & Comfortable! We pride ourselves in giving Excellent Service and making sure that all our guests get everything they want out of their time in London! Full Facility Kitchen, Fridge Freezers & Dining Rooms accessible 24 Hrs. All London Tourist Attractions are Easily Accessible by Tube, Taxi or Bus. Located 3 Minutes Walk from the Dollis Hill Tube Station (Jubilee Line), 24Hr Bus Station & a 24Hr Taxi Station. At the Heart of all Local Amenities, in addition to the Local Job Centre, Library and Post Office. All Rooms are Spacious & Comfortable with Thick Soft Mattresses, Clean Sheets, Soft Duvets & Pillows, Storage Shelves & Lockers, Power Sockets, WiFi and All Other Creature Comforts you would Expect! All Our Rooms are Cleaned Daily. Quite Possibly the Friendliest People in the World! Our Staff have all travelled extensively and have Broad Local and International Travel Knowledge. Please Feel Free to Ask Us Anything! We understand that Security is Paramount to all of our Guests. Accordingly, we have 24Hr CCTV, Key & Card Entry System, Secure Storage & Locker Facilities and Live-In Staff. Huge Trendy Lounge which opens to an Outdoor Garden. A Perfect Space to Relax and Socialize. 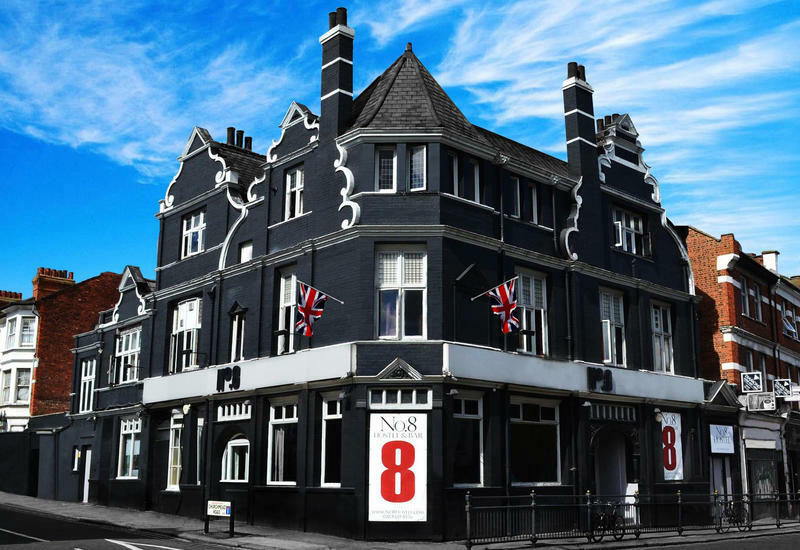 We look forward to Welcoming you at No.8! Heathrow Airport - Dollis Hill Station Take the Piccadilly Line (Dark Blue Line) to Green Park Station; Change to the Jubilee Line (Grey Line) to go to Dollis Hill Station; From Dollis Hill Station, see directions below. Gatwick Airport - Dollis Hill Station Take the Gatwick Express Train to Victoria Station; Change to the Victoria Line (Light Blue Line) to go to Green Park Station; Change to the Jubilee Line (Grey Line) to go to Dollis Hill Station; From Dollis Hill Station, see directions below. Stansted Airport - Dollis Hill Station Take the Stansted Express to Liverpool Street Station; Change to the Central Line (Red Line) to go to Bond Street Station; Change to the Jubilee Line (Grey Line) to go to Dollis Hill Station; From Dollis Hill Station, see directions below. Luton Airport - Dollis Hill Station Take the Thameslink to West Hampstead Station; Change to the Jubilee Line (Grey Line) to go to Dollis Hill Station; From Dollis Hill Station, see further directions below. London City Airport - Dollis Hill Station Take the DLR to Canning Town Station; Change to the Jubilee Line (Grey Line) to go to Dollis Hill Station; From Dollis Hill Station, see directions below. Waterloo Station - Dollis Hill Station Take the Jubilee Line (Grey Line) to go to Dollis Hill Station; From Dollis Hill Station, see directions below. Victoria Station - Dollis Hill Station Take the Victoria Line (Light Blue Line) to go to Green Park Station; Change to the Jubilee Line (Grey Line) to go to Dollis Hill Station; From Dollis Hill Station, see directions below. Dollis Hill Station - No.8 Take the Jubilee Line (Grey Line) to the Dollis Hill Station; Take the left exit onto Chapter Road; Turn Right out of the Station and proceed to the end of Chapter Road, which meets Dudden Hill Lane; Turn Left onto Dudden Hill Lane and No.8 is a 2 Min Walk down Dudden Hill Lane.